Railroad Crossing Offenses | Cook County, Illinois Railroad Crossing Violation Lawyer The Davis Law Group, P.C. Contact Will County, Illinois Traffic Crime Defense Lawyer The Davis Law Group, P.C. The traffic attorneys at The Davis Law Group, P.C. regularly represent clients on a variety of traffic violations, including those involving railroad crossings. Some of the most common railroad offenses in Illinois are listed below. Illinois law (625 ILCS 5/11-1201) requires all drivers to stop within 50 feet but not less than 15 feet from the nearest rail of the railroad under various circumstances including, but not limited to, the following: an electric or mechanical signal device gives warning of the immediate approach of a train or track equipment, a crossing gate is lowered, or when a train or track equipment is plainly visible and in hazardous proximity to the crossing. If any of these circumstances exist, the driver must stop and wait to proceed until the tracks are clear and they can do so safely. Illinois law also prohibits a driver from driving their vehicle through, around or under a crossing gate while the gate is closed OR is being opened or closed. A minimum fine of $500 is imposed for a first violation this law. The court may allow the driver to complete community service hours in place of the minimum fine for a first violation. A minimum fine of $1000 is imposed for a second or subsequent violation. In addition, upon receiving notice of a second violation, the Illinois Secretary of State may suspend the offender’s driver’s license for a minimum period of 6 months. 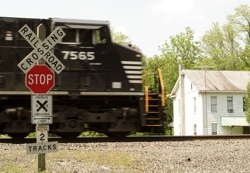 Under Illinois law (625 ILCS 5/11-1202), certain vehicles must stop at all railroad crossings. The driver of these specified vehicles must stop their vehicle within 50 feet but not less than 15 feet from the nearest rail. The driver may not proceed until they have listened and looked for the approach of a train or railroad track equipment and determined that movement can be made with safety. Some of the vehicles covered by this law include school buses (which are subject to additional requirements under this law), any second division vehicle carrying passengers for hire, and certain vehicles carrying hazardous material. There are various exceptions to this law (i.e. abandoned industrial railroad crossings). The attorneys at The Davis Law Group, P.C. handle traffic violations throughout the Chicagoland area and Illinois including Cook County, Lake County and DuPage County. Please remember that the information on this website is not exhaustive and it is advisable to consult an attorney to discuss your particular situation. If you have received a traffic ticket for a railroad crossing violation, feel free to contact our defense attorneys to discuss your case.